Designed by George Stanley in 1965 and unofficially known as the "Maple Leaf," the Swarovski 81852 BeCharmed Pavé Flag "Canada" is red and white, as proclaimed by Britain's King George V in 1921. The red comes from the British St. George cross, and the white comes from the French royal emblem of King Charles VII. Consisting of a multitude of crystals carefully positioned by hand, the bead's surface is an intricate pavé effect that gives subtle reflections. Branded with "Swarovski Crystals" as a certificate of authenticity, it is a stunning reminder of the beautiful country of Canada. 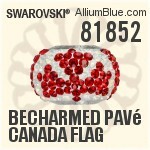 Swarovski 81852 BeCharmed Pavé Canada Flag consist of lead-free ADVANCED CRYSTAL by Swarovski.